Four districts of Jammu and Kashmir-- Pulwama, Kulgam, Shopian and Anantnag -- have been on the boil since the killing of the Hizbul Mujahideen militant. 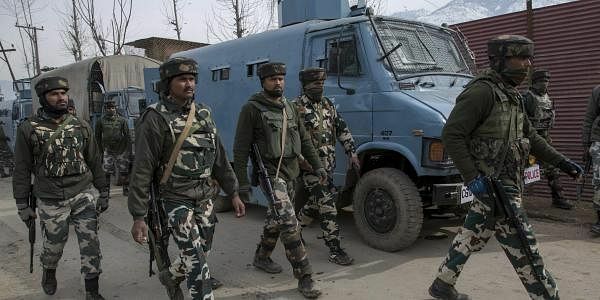 NEW DELHI: More than 21,000 additional central paramilitary forces have been deployed in Jammu and Kashmir for the security of Amarnath yatra and ahead of the first death anniversary of Hizbul militant commander Burhan Wani. "We are well prepared to handle any situation in Kashmir. We have sent 214 companies of central forces to control any situation which may arise on July 8 and during Amarnath yatra," Union Home Secretary Rajiv Mehrishi told reporters here. A single company of central paramilitary force comprises 100 personnel. These forces are in addition to the state police forces and those deployed for anti-militancy duties. Four districts of Jammu and Kashmir-- Pulwama, Kulgam, Shopian and Anantnag -- have been on the boil since the killing of the Hizbul Mujahideen militant in an encounter with security forces on July 8, 2016. Over 80 young men from these areas had taken to arms since the encounter, official sources from the state had said earlier. Seventy-six civilians and two police personnel were killed during the five-month unrest in the Valley following Wani's killing. The state government has also announced 10-day holidays for all educational institutions from July 6. The holidays coincide with a protest schedule issued by the United Jehad Council (UJC), an amalgam of militant organisations operating in the Valley. The UJC had announced the protest programme on Monday in connection with what it called the first death anniversary of Wani. The Centre has also announced additional security for the revered Amarnath yatra. The 40-day long yatra began on June 28. So far more than 90,000 pilgrims have paid obeisance at the cave shrine located at an altitude of 3,888-metre in south Kashmir.